Rumble Strips or Not Along Wide Shoulders Designated for Bicycle Traffic? Presented at the 1995 Annual Meeting of the Transportation Research Board. Drivers drifting off the road not only put the lives of themselves and those inside their car in serious jeopardy, but also the lives of bicyclists riding along the shoulder. An estimated 90% of all cycling fatalities each year are the result of a collision with a car. Rumble strips can go a long way toward protecting cyclists from drifting drivers. Despite the safety benefits of rumble strips for cyclists, cycling groups in some states have opposed rumble strips claiming that they are uncomfortable, or even dangerous to cyclists who cross them. Fortunately, no state using the 7-inch milled rumble strips have shown that cyclists are at risk riding along highway shoulders fitted with rumble strips. A Transportation Research Board study estimates that a cyclist traveling at only 10 mph for a one-hour ride along a road with moderate traffic (1,000 cars/hour) has a 7.8% chance of encountering a driver dozing off behind the wheel. Should one of those dozing drivers drift off the road at 50 mph and hit a cyclist, the chance of a cyclist fatality is 98%. And drowsy driving is only one of various causes that result in a run-off-the-road (ROTR) crash. Even though shoulder rumble strips have proven safe for cyclists, highway authorities should not ignore protests from cycling advocates who claim the rumble strip is a safety liability. To do so could discourage cyclists from using the very roads that rumble strips have helped make a safe place to ride. Other states have gone too far in the opposite direction to appease cyclists. Some states have all but abandoned the use of shoulder rumble strips, allowing thousands of preventable fatalities and injuries to occur every year along untreated highways. In other instances, states have weakened the effectiveness of the rumble strips by making the cuts shallower, or reducing their length and width to provide a “more comfortable” ride for cyclists. Rumble strip were never meant to provide a comfortable ride, and any rumble strip that does, isn’t working. SPT has worked with most state and federal highway agencies addressing the issue of cyclists and rumble strips. We often network different state department of transportation offices addressing similar issues, and we can provide your office a thorough background on these issues and present you with the most effective solutions thus far. The Alaskan highway system claims some of the most beautiful bicycling routes in the nation. Locals and tourists by the thousands flock to Alaska each year to bike along their roadways. But drift-off-the-road crashes also claim the largest category of its fatal and injury accidents. Clearly, Alaska needed to develop a rumble strip policy that not only saved the lives of motorists, but also protected cyclists from drivers drifting off the road. The Alaska Department of Transportation was unwilling to sacrifice the safety interests of motorists or cyclists in developing their rumble strip policy, but they also wanted to ensure their roads remained popular for cycling. 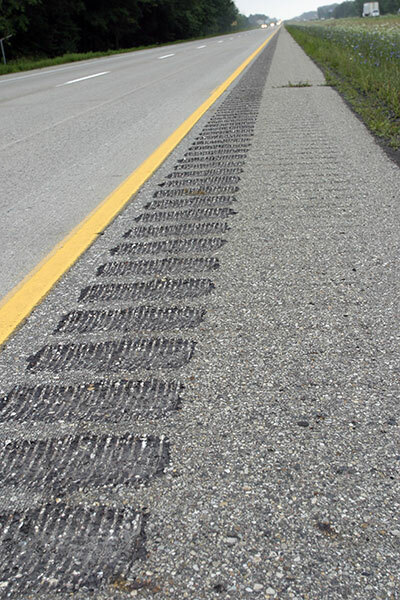 Alaska DOT engineers researched bicycle-friendly rumble strip policies throughout the United States, and formulated perhaps the most responsive and safest bicycle-friendly rumble strip policy in the nation. The Transportation Research Board has published the work of Per Garder, professor of engineering, University of Maine. Through field studies and statistical analysis, Professor Garder examined the possible safety benefits and liabilities for cyclists of using rumble strips along highway shoulders. Transportation Research Board, 74th Annual Meeting, January 22-28 1995, Washington, D.C.